Description: Carousel (1945), with music by Richard Rodgers and the book and lyrics by Oscar Hammerstein II, was their second collaboration following the surprising success of Oklahoma! (1943). 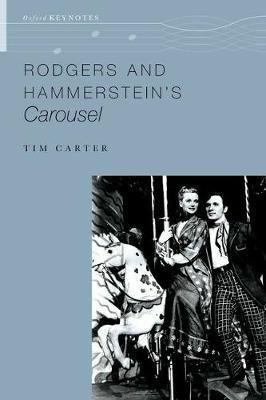 Description: Carousel (1945), with music by Richard Rodgers and the book and lyrics by Oscar Hammerstein II, was their second collaboration following the surprising success of Oklahoma! (1943). They worked again with Theresa Helburn and Lawrence Langner of the Theatre Guild (producers), Rouben Mamoulian (director), and Agnes de Mille (choreographer). But with Oklahoma! still running to sell-out houses, they needed to do something quite different. Based on a play, Liliom (1909), by the Hungarian playwright Ferenc Molnar, Carousel took Broadway musical theater in far darker directions because of its subject matter-the protagonist, Billy Bigelow, is wholly an anti-hero-and also given its extensive music that some claimed came close to opera. The action is shifted from a gritty working-class suburb of Budapest to the New England coast (Maine), but the themes remain the same as two social misfits try to survive harsh economic times. Billy Bigelow is unemployed, prone to domestic violence, and dies in the course of committing a robbery; Julie Jordan sticks by him through thick and thin; and the show seeks some manner of redemption for both of them as Billy is given a day back on earth to do some good for his wife and their daughter. Troubling though these matters are nowadays, they fit squarely in the context of a country moving through the end of World War II to an uncertain future. Not for nothing had composers such as Giacomo Puccini and Kurt Weill already tried to persuade Molnar to release his play. It also led Rodgers and Hammerstein to new heights: songs such as "If I Loved You," Billy's "Soliloquy," and "You'll Never Walk Alone" transformed the American musical. In this book, we discover how and why they came about, and exactly what Carousel was trying to achieve.